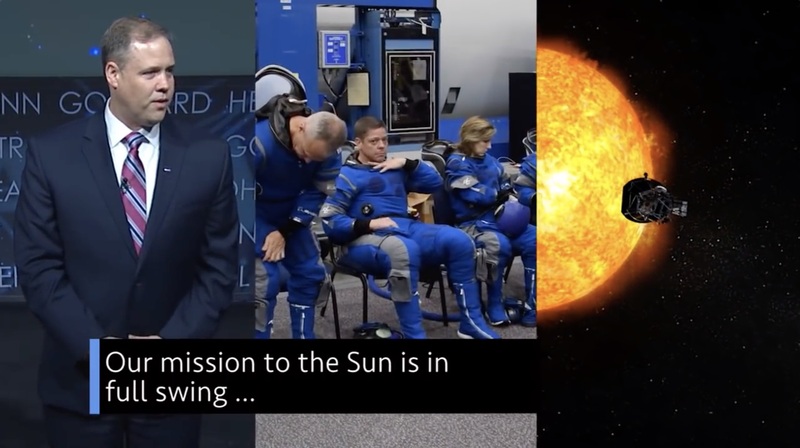 And, our mission to the Sun is in full swing … a few of the stories to tell you about – This Week at NASA! The administrator pointed to some significant exploration milestones during the shutdown the NASA workforce helped make possible … like the OSIRIS-REx sample return mission’s arrival at asteroid Bennu. And the New Year’s Day flyby of Kuiper Belt Object Ultima Thule by our New Horizons spacecraft. The encounter – some 4 billion miles from our Sun – is the farthest exploration of a celestial object by any spacecraft in history. The town hall wrapped up with a “video look-ahead” to 2019 and the many missions and projects the agency is working on. You can check out that video for yourself, by visiting nasa.gov/next. SpaceX, who along with Boeing, is one of our partner companies developing spacecraft to restore launches of American astronauts from American soil – recently performed checkouts, including a static firing, with its Falcon 9 rocket and Crew Dragon spacecraft at our Kennedy Space Center, in Florida. The checkouts are in preparation for Demo-1, the inaugural, uncrewed flight of the Crew Dragon. Meanwhile, our Mike Fincke has been named to replace Eric Boe on the crew of the Boeing CST-100 Starliner’s Crew Flight Test. Boe is unable to fly due to medical reasons. This flight test, targeted for launch later this year, will be the first launch of the new spacecraft with humans on board. Fincke joins our Nicole Mann and Boeing’s Chris Ferguson on the crew. Our Parker solar Probe spacecraft, which recently completed its first orbit of the Sun, has now begun the second of 24 planned orbits, on track for its second closest approach to our solar system’s star, on April 4. With all systems online and operating as designed, the spacecraft has been delivering data to Earth via the Deep Space Network. Data from the mission will help answer questions about the Sun’s fundamental physics — including how particles and solar material are accelerated out into space at such high speeds and why the Sun’s atmosphere, or corona, is so much hotter than the surface below.